As the title says, I'd like to have an alternative for Xfire. We desperately need to be able to chat with each other outside of the game. Facebook works in great but there are many many many valid reasons not to use that, which is why we are looking for a new platform to use. Of course, we have this forum, but this isn't the place for a quick chit-chat, but rather for constructive topics and discussions, alongside some random talk. If anyone has suggestions, that'd be very much appreciated! Yes, you can do that with anything and Steam would be nice. 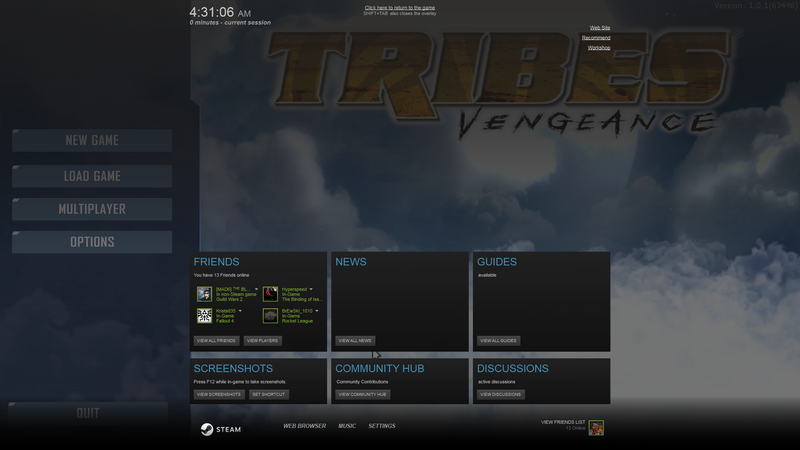 People can even see you are playing Tribes Vengeance. There's an existing group at http://steamcommunity.com/groups/TribesV but I made a new one at http://steamcommunity.com/groups/TribesReVengeance so we can have more control in the hands of people that actually play this game. Will instate the appropriate admins when they join the group. While I'm at it I'll fire off an email to Hirez about the rights of T:V and the viability of putting the game on Steam. B7ADE wrote: There's an existing group at http://steamcommunity.com/groups/TribesV but I made a new one at http://steamcommunity.com/groups/TribesReVengeance so we can have more control in the hands of people that actually play this game. Will instate the appropriate admins when they join the group. While I'm at it I'll fire off an email to Hirez about the rights of T:V and the viability of putting the game on Steam. Speaking on that subject do u guyz actually own this game? in 2015 hirez realeased it as freeware. As far as im aware that means anybody can take it. for free. But now that you guyz have 'taken' it is it still 'takeable' by other people? B7ADE wrote: We "took" it way before Hi-Rez released it for free. It was just an effort by a few people to get it up and running. We don't own any rights. Other people are free to "take" it and modify it as they see fit. I'm not sure I see the problem here. Enlightenen me. Would it be a good idea to put up a guide on how-to get T:V shown as the game being played on Steam?